Though I know you are the fond of blogging and want to make your blog a poupular one. Really appreciate these thoughts and I wish you all the very happy blogging journey. After spending decent number of years in blogging I have selected few blog submission directories or you can say networks which are truly very good and fruitful in terms of traffic and all. I would like to share few of them with you people and I am sure you will like that list. Best of the Web Blog Search – I would say its giant blogging network with 6 Google PR. Though it is a giant network its moderators are very strict. It is not an easy task to get approve your blog there. On Top List – OnTopList.com, it’s a great network with PR 6 for blogging geeks. You can expect a decent traffic from this directory. Also you can share your articles there as they offer a separate article submission section as well. Networked Blog – It is a most popular blogger’s network and I live to spend my time there. It’s a PR 7 blog directory where anyone can easily perform blog submission. Blogengage – It’s a PR 4 blogging network that offers a great platform to bloggers to promote their blogs. Indi Blogger – Another PR 4 blogging network which connects Indian bloggers. With this platform anyone can get very decent blog traffic like I am getting and also the connected people can enjoy the excited blogger meets organized by this community. Though there are uncountable blogger’s network & directories and it is not possible to share and define each and every one so below is the list of all top blog directories and networks where you should submit your blog. 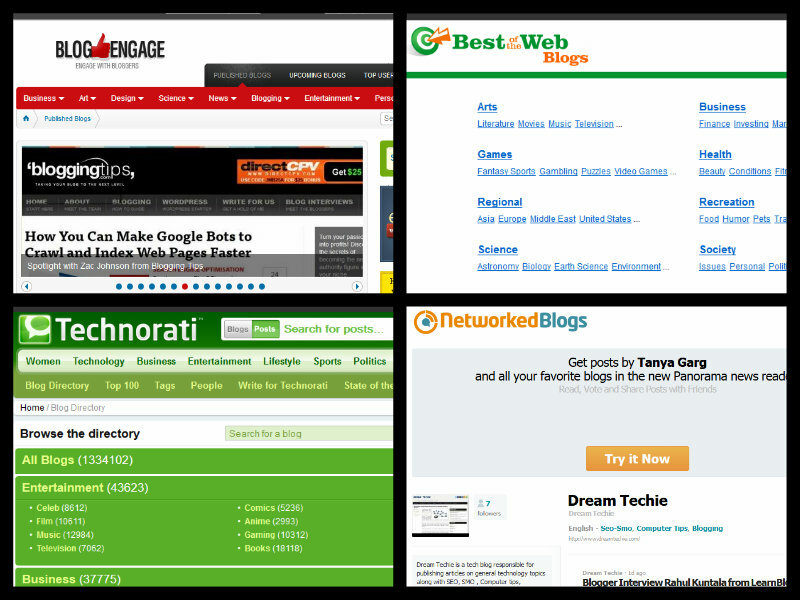 Don’t forget to share your most preferred blogs network here in our comment section. Well, You need to mention some more high PR blogging site which tends to achieve lead generation for your business. Thank you for the post, Good list for generating some quality backlinks. Really great collection you made for blog submission. It’s helpful for me as new comer in blogging world. Now i’m going to apply these tips on my blog. Hope i’ll do my best. I’m new as blogger, thanks for the list. Can you tell me, actually what is the function of all directories list above? I really need someone can tell me how to be as real blogger, i think i need teacher to teach me about blogger, can you be my teacher? Please share how can i help you? As much as I would like to appreciate you on your efforts I would also like to point here that Technorati don’t allows to submit your blog anymore. On a side note I Would love to see more posts from you. Good to see you here and thanks for mentioning about Technorati. Yes I am aware with the fact that “Technorati no more accepts blogs”, this is the reason I used Strikethrough there on Technoti point. Nice u giving a very important & unique directory submission site list. hi Rakesh VermaThis is a wonderful list of blog website. I will definitely use the above website in future. I would like to add one more website with you.